Still yet more captions. 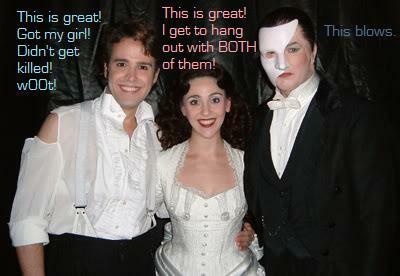 A few more pointless and stupid Phantom stage captions.. Wallpaper and background images in the The Phantom Of The Opera club tagged: phantom of the opera alw erik christine raoul captions Phantom opera poto. This The Phantom Of The Opera fan art might contain bridesmaid, maid of honor, dinner dress, dinner gown, formal, evening gown, and gown.